SP Chief Mulayam Singh Yadav once again on Sunday in state capital of Uttar Pradesh expressed his agony on demolition of Babri Masjid (mosque in Ayodhya). 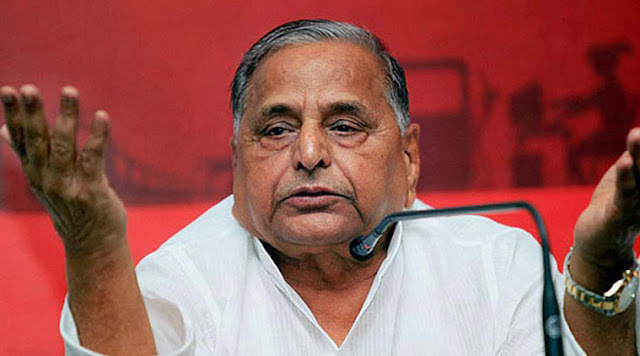 Mulayam said that he was saddened for firing order by administration on Kar Sevaks (volunteers), but the religious place was much important to protect. It is noticeable, On December 6, 1992, a large crowd of Hindu Kar Sevaks ("volunteers") entirely destroyed the 16th-century Babri Masjid mosque in Ayodhya, Uttar Pradesh, India, in an attempt to reclaim the land known as Ram Janmabhoomi (the mythological birthplace of the Hindu god Rama). All Hindus faith is devoted this pious place. The demolition occurred after a rally supporting the movement turned violent and resulted in several months of intercommunal rioting between India's Hindu and Muslim communities, causing the death of at least 2,000 people. SP Chief offered first the floral tribute on the picture of Jannayak Karpoori Thakur. Mulayam Singh scolded his ministers on this occasion. He said, “If the aim of life was to earn money, you had better be businessmen instead of joining politics. The conduct of half of the ministers has not yet improved. Ministers are not desisting from his malpractices. I am vigilant on their activities." Mulayam Singh told the reminiscence of Karpoori Thakur in the programme. A special programme in SP office was organized on the occasion Jannayak Karpoori Thakur.